(or letters) that are multiplied usually in brackets. We use Algebra following certain rules. A letter can represent an object, price, etc... It can be thought as a case of shorthand with letters. This means that we will get expressions that have letters rather than the full titles of objects each time. Why do we do factorising? 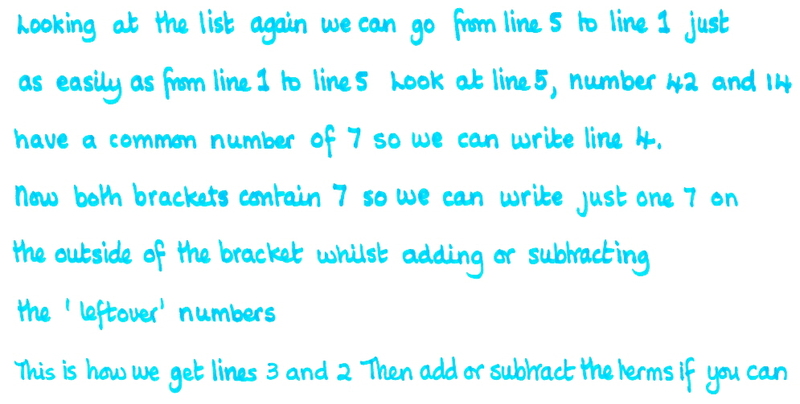 To make your calculations easier but often it is the first stumbling block in a long list! What do the brackets mean? Why do we do bother factorising again? Is there only one type of factorising? No, there are lots and you will have to choose depending on the expression. Sometimes you may have to use more than one type to fully factorise your expression! We use factorising to solve equations, so all variables are one side and on the other side zero. We factorise so on one side we have terms multiplied together and zero on the other side. Here is an example of how any number may be rewritten, you will notice that although the appearance is different but the answer is the same.